A documentary is a film that tells a non-fiction story, but how one goes about telling it can vary greatly and there is a place for all styles. My favorite film of the year thus far is the 7 hour long masterpiece O.J. : Made in America, and because that is such a sprawling and comprehensive piece telling a story that spans decades it had to be done using a combination of actual footage along with interviews with those involved in the various moments. Ironically, that is usually the type of doc that doesn't draw me in as much because the standard person talks to camera with cutaways to footage format doesn't feel quite as riveting as the type of film that immerses you in the reality of others. Films that feel voyeuristic, like the audience is seeing something it shouldn't. O.J. : Made in America transcended any issues I may have had with its style because it was handled with such tremendous patience and intelligence, painting with a broad and brilliant brush that illustrated every single piece of nuance that went into the life of O.J. Simpson and the brutal double murder that he likely got away with. While the new documentary Weiner is unable to reach the impossible heights of that picture (Made in America is easily my favorite ever in the genre), it's not far off and ironically far more my style. What we have here is the fly on the wall style of filmmaking that gives viewers a rare glimpse into what goes on behind the scenes of a political campaign, but not just any campaign. One mired in a scandal that creates a truly surreal environment that these people occupy, all captured by the cameras of filmmakers Josh Kriegman and Elyse Steinberg. Anthony Weiner was a rising star in the political scene, a democrat from New York that served their 9th congressional district from January 1999 through June of 2011, and he didn't merely keep his seat, he dominated seven elections in a row. Accompanied by his beautiful wife Huma Abedin who also happens to have powerful political connections as well, as she has worked for Hillary Clinton for 20 years now starting as an intern in the White House and now serving as vice chairwoman of her Presidential campaign, the sky was the limit for Anthony...or so it seemed. In 2011, a sexting scandal erupted when his own Twitter account posted an explicit photo of himself and eventually he was forced to come clean about his transgressions with women he met online, none of which he had ever met in person. He resigned from his position in Congress and began to rebuild his public image, apologizing for what happened while salvaging his marriage after the birth of their first son. The world forgave and moved on and when Anthony Weiner began a run at becoming the next Mayor of New York City, he was leading in the polls. A true comeback story. Then it happened again. New images, even more revealing then the previous batch, and what was more damning were the dates they were taken, right around the time he was initially exposed and even shortly after. The documentary began filming far earlier than this new scandal, as it was initially meant to be a peak behind the curtain of a man seeking redemption story. Now this film became so much more. I cannot say enough positive things about the way Weiner was assembled, edited perfectly to maximize the entertainment value of the subject and his circumstances while also allowing the camera to feel like a living, breathing thing, lingering with longer takes of silence to demonstrate the humanity of the situation beyond funny headlines and national embarrassment. We see all the various covers of the New York Post using his last name as a way to capture the attention of readers, but because of the actions of Anthony, Huma is forced to face all the shame and deal with her own pain. Their son will one day learn of what his dad did, a conversation they will have to engage in that as a father I do not envy. Even just being able to see the faces of those that work for his campaign, the people that believed so deeply in him and what he was trying to do, when they were allowed to let their guard down and let their concerns and frustrations bubble to the surface. All of it is endlessly fascinating and at times heartbreaking. Weiner is quite funny though, and it's okay to laugh. Part of what makes the experience so enjoyable on a comedic level is Anthony's ability to make light of it himself, and regardless of where you fall on the political scale it's hard to deny the courage of a man who is willing to face the heat of the same embarrassing questions over and over and over again yet not throw in the towel, entering rooms of people that he knows to be hostile towards his private behavior but he somehow keeps his head held high and fights back, sometimes too hard. One of the finest frames of the film pops up shortly after an interview between Anthony and MSNBC host Lawrence O'Donnell, a contentious altercation to say the least. The way the filmmakers choose to shoot this moment, as Anthony and Huma watch the way it went down on television via Youtube, is outstanding because on the one side you have Weiner not even trying to hide his smile. It's hard to witness this moment and not recall back to when he was criticized for being a narcissist earlier in the doc as it truly appears as if he is enjoying the moment despite it being an ugly piece of tape certain to impact his chances of winning the election. On the other side is his wife Huma, so strong to stand by the person she loves through thick and thin and yet now while Anthony soaks in the spotlight, she cannot even pretend to want to watch. There in one frame, he looks one way and she another, he with a smile and a stream of laughter and she through eyes that look ready to burst with tears. It's a perfectly filmed moment capturing a marriage that is deeply, profoundly troubled. 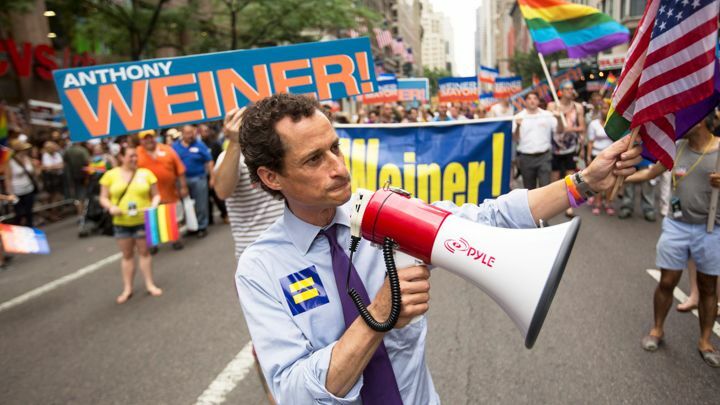 Weiner is a film that feels stranger than fiction, at times playing like a mockumentary that cannot possibly be based in fact. Whether it is watching Anthony waving flags proudly at various parades, walking quietly down the city streets with his baby boy in a stroller or quite literally being chased through a McDonald's by the girl who released his most damning pictures, this movie is endlessly compelling and a must see.